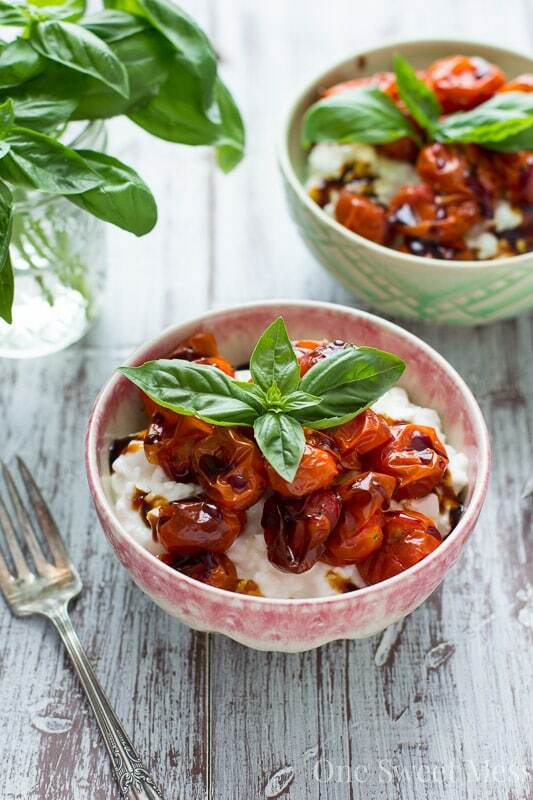 Sweet roasted tomatoes, fresh basil, and a drizzle of balsamic glaze get piled on top of creamy cottage cheese. Your lunch bowl never looked better. I’m always looking for new ways to spice up my lunchbox. This roasted tomato basil cottage cheese bowl is healthy, rich in protein, and loaded with ripe tomatoes that have been roasted to sweet perfection. I was one of those rare kids that would eat pretty much anything and everything my parents placed in front of me, cottage cheese being one of my favorite snack items. I used to eat it with a sprinkle of salt and extra freshly-cracked black pepper. These days, I get a little more fancy with my toppings. Friendship Dairies Cottage Cheese is known as the original superfood. I chose their 1% cottage cheese for this recipe and used it as the base for these protein-packed bowls. One serving of their cottage cheese contains 15 grams of protein–that’s enough to fill you up and keep you full until your next meal. Cottage cheese is extremely versatile. It will take on pretty much any flavor you choose to give it. For this recipe, I spooned roasted tomatoes over the top and drizzled it with sweet balsamic glaze. The sweet juices from the tomatoes soak into the cottage cheese, adding a burst of flavor with every bite. To liven up the dish, I added a healthy pinch of fresh basil to the top. This dish reminds me of the classic caprese salad I love so much in the summer. Visit Friendship Dairies for more mix-in inspiration using their Superfood Generator and to enter The Super-Duper Totally Fantastic Superfood Mix-In Sweepstakes for a chance to win weekly prizes (no purchase necessary). Creamy cottage cheese gets topped with sweet roasted tomatoes, fresh basil, and a drizzle of balsamic glaze. Place the grape tomatoes on the baking sheet and drizzle with olive oil. Sprinkle with a generous pinch of salt and pepper. Bake for 20 minutes. Allow the tomatoes to cool on the baking sheet for 5 minutes. Divide 2 cups of cottage cheese between 2 bowls. Top each bowl of cottage cheese with equal amounts of the roasted tomatoes. Season with salt and pepper to taste. Drizzle each bowl with 1 teaspoon of the balsamic glaze. Top with basil. Disclosure: Thank you to Friendship Dairies for sponsoring this post. All opinions are 100% my own. Thank you for supporting my site while I work with brands I use in my kitchen. I eat cottage cheese like it’s going out of style, and always need some new ideas to jazz ‘er up! I would have never thought about going the tomato, basil route…but this is OFF DA HOOK. Pinned! And here I thought I was the only one (besides my grandmother) who buys cottage cheese in bulk :) Thanks for the sweet comment and for the pin. Such a FANTASTIC idea!! I’m tired of only fruit on top of my cottage cheese. This looks amazing! I have a giant container of cottage cheese in my fridge right now and have been struggling to figure out how to finish it. This is such a great idea! I have been eating so much cottage cheese lately, it’s kind of ridiculous. I love it so much in the summer, just because it’s a nice and cold lunch, I guess. These roasted tomatoes look absolutely divine, and you can really never go wrong with a drizzle of balsamic! This is seriously gorgeous! 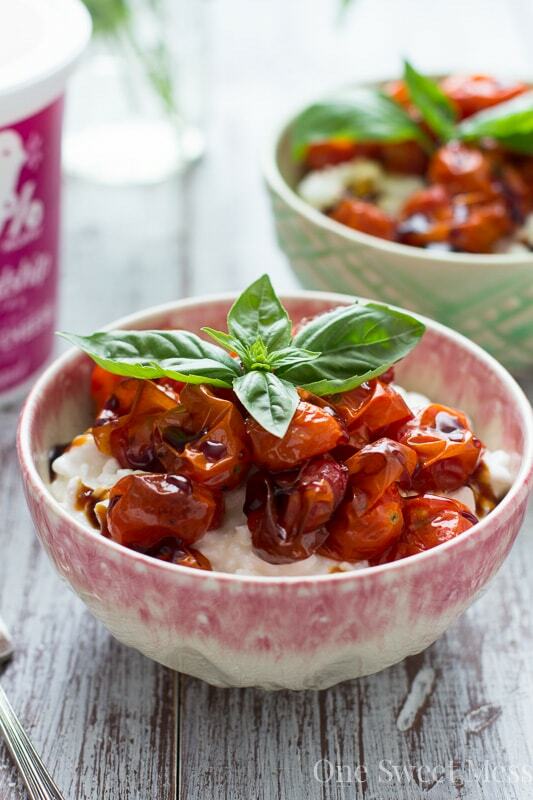 There is nothing better than roasted tomatoes, genius idea to turn it into a tasty bowl recipe. Just in love with this flavour combination! Why have I never thought to dress up cottage cheese this way?! What an awesome light lunch or snacktime idea. You know I’ve never had cottage cheese? It’s one of those foods I kind of assumed I wouldn’t like because of the look. Crazy I know but these roasted tomatoes and basil on top has me wanting to change that opinion stat! I’ve only ever had fruit on top of my cottage cheese, never anything fun like this. Love roasted tomatoes, basil,and balsamic- I think I know what I’m making next time I have cottage cheese!